Everyone says THE thing to do in Rajasthan is a camel safari, where you head out on your ship of the desert for 3-4 days, sleep under the stars, experience life as a camel herder etc etc. After hearing horror stories of people walking funny for days after just 2 days on a camel, we opted instead for a 2 hour camel ride to see the sand dunes of Khuri. And 2 days later, we're still walking funny and Phil's groaning like an old man. 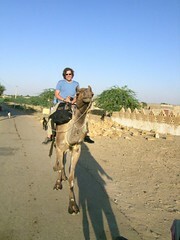 Our drivers decided this was to be no leisurely camel ride - it was a race to the death. So off they galloped, and sitting astride a galloping camel is about as comfortable as being whacked in the groin with a large padded mallet 5 times per second. I'm sure there's a technique whereby you don't just bounce up and down, but we didn't learn it. Instead I bounced so high I got completely airborne with each stride and at several points the driver sitting behind me put his hand on my shoulder to stop me bouncing right off the saddle. Part of the problem was the more I bounced, the harder I laughed, the faster the camel driver drove the camel, and the more I bounced. It was a painful but screamingly funny feedback loop. Phil, being taller and heavier, fared even worse than me but luckily the family jewels are unharmed. 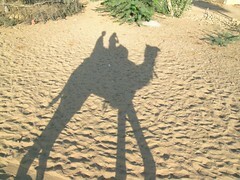 And to add insult to injury, camels are flatulent like no other beast.